Please see below for the video with English translation. Translation was provided by Jill Clark and Nancy Cox. Never before has a Mexican presidential contender received as much international attention as former head of government of Mexico City and three-time candidate, Andrés Manuel López Obrador. With a campaign focused on criticisms of corruption and "neoliberal" policies under the previous three governments, López Obrador and his National Regeneration Movement (MORENA) party represent the Mexican left's best shot at winning the presidency in recent history. He currently leads the polls in what is sure to be a close race between numerous candidates, to be decided in a single round in July 2018. 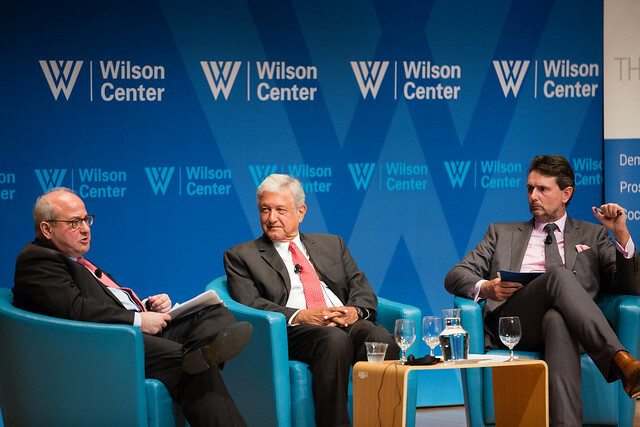 The Woodrow Wilson Center's Mexico Institute and the Inter-American Dialogue were pleased to welcome López Obrador for an open and frank discussion of his policy proposals and his view on domestic and foreign challenges facing Mexico - including a complicated relationship with Washington. "It is not a matter of laws but rather, political will." “If the President is honest, then the governors will have to be honest, so it [trickles] down to the last civil servant. We are going to clear corruption out of government from top to bottom – just like sweeping the stairs." Que la honestidad sea forma de vida y forma de gobierno." "Vamos a producir en México lo que consumimos. Ya no compráramos en el extranjero lo que consumimos." "Con la participación de los tres sectores: el público, el privado y el social. Vamos a sembrar un millón de hectáreas de árboles maderables y frutales en el sursureste del país. Se promoverá la agricultura, la ganadería y la pesca, habrá una política de fomento industrial y de apoyo a pequeñas y medianas empresas. Se va construir la nueva vía de ferro carril de pasajeros hacia la frontera norte y el tren rápido de la ruta maya—Cancún, Tulum, Calakmul, Palenque." "En todo el territorio nacional, habrá señal de internet." "La educación no es un privilegio, es un derecho del pueblo, de los ciudadanos". "I do not agree that a lot of investment has come to Mexico, due to the structural reforms and in particular due to the energy reform. That is part of their publicity that millions upon millions of dollars, nor is it completely true, that those investments are responsible for the discovery of new oil deposits. That is simply the opinion of those who are defending the energy reform. But that reality is different. Such investment has come, and production is falling off." "Bueno, yo difiero en que haya llegado mucha inversión a México por las reformas estructurales, en particular por la reforma energética. Eso es parte de la publicidad, miles de millones de dólares e incluso tampoco es de todo el cierto que por esas inversiones se descubren nuevos yacimientos de petróleo. Esa es la opinión de quienes defienden las reformas. La realidad es otra. No hay esa inversión y se está cayendo la producción." "We are going to modernize the six refineries. We have already gone through a reconfiguration and modernization process in Minatitlán, Cadereyta, and Ciudad Madero refineries. This has been done with an investment along the order of 800 million dollars, but thanks to corruption those refineiries are still there and they dont have capacity to produce gasoline. “I do hope the DACA decision is amended and resolved." “If the U.S Congress decides to support the closing of the doors to innovators– very soon Mexico’s borders will open to all the young people who want to move forward in science and technology. "¡En México, las puertas estan abiertas!" This is the second event in a series related to the Mexico Institute's coverage of the 2018 Mexican elections, featuring contenders and presidential candidates. For more on the Mexico Institute's election coverage, visit our 2018 Mexico Elections Guide. This event was conducted in Spanish. Simultaneous Interpretation equipment was provided.